In twenty two minutes, it will be Christmas again. I stand in the silvered but tarnished half hidden light of a frozen moon, and wait expectantly. In the full light of the day around half-past morning, my family will arrive, and the celebration will start. Being too excited to sleep I made a mistaken effort to draw unconsciousness to my wired senses; I left my bed, piled high in goose down excess, pulled on stiff jeans my husband’s wool work shirt and several shapes and sizes of heavy winter wear and headed outside. Earlier in the week, we had decided to spend Christmas in the country, in the old family farmhouse behind Spice Knob Hill, the one we have been slowly repairing for use as a holiday place. We have repaired most of the cracks and the inviting secret entrances, so I feel comfortable; I can forget my earlier thoughts of fuzzy, furry things meeting me in the hall some night. It is dark on the farm and other than a peek-a-boo moon and a single brave star peeking through the stalwart clouds; nothing else shines, glows or reflects; the Kentucky night is deep and there is the scratch of ice on the ragged wind. Far in the distance on the creek, I hear the yip yipping of a lonely coyote and the occasional crashing of deer hooves running through the barren fields, of broken and stripped corn stalks. With a steady snow chilling my cheeks, I wander through the horse lot toward the barn. Still desiring a slowing of my senses and longing for droopy eyes I head for shelter. I duck into a door flung wide open; in the barn is a makeshift manger scene. Standing there is an old claw foot bathtub full of clean hay for the grandchildren’s pets, it will keep them cozy during the long winter nights. Tossed around are the other bales of hay, and they smell so sweet here out of the sharp wind. The scene tugs at my imagination, and it beckons to me. I skirt past the door and find a hard seat on a splintered old bench made from the half trunk of an ancient pecan tree. 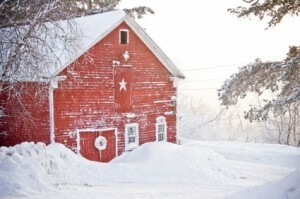 I rest my tilted head for a moment on the weathered barn siding; gazing outward and upward I peer at the Christmas sky. I experience thrills upon thrills as I think I can see throngs of shadowy singers in the sooty sky; they are a part of joyful celebration. Echoed by a thousand of voices—even my own—a melodic chorus begins and the word “Glory” rings through the heavens. Now notes, tones, strings and voices are blending—bending more in my heart than in my ear—and it is “Hallelujah” they are singing in might and softness; reverently and jubilantly, each one is expressing their own emotions. I sit entranced in a cold barn re-breathing my own vapor, longing to be dancing, singing, and praising in the air. Time has paused; I shift, re-settle and watch the sleet now raining down. I begin to think again of earthly matters; the turkey is thawing in the kitchen and I have three pies to make; just as I decide on Dutch apple, chocolate and cherry pie, a stirring takes place, and the shadows have returned this time at eye level. There in the porcelain manger is a baby, wrapped in wool and linen, snug and warm on a bed of hay. A young woman, her husband and other welcome guest surrounded him, amid the low bleating of sheep and the soft mewing of the mouser cat. The baby’s fingers wiggle and I feel as though they are gripping my heart. Softly I hear a name escaping the Mother’s lips, “Jesus”. I experience redeeming love that floods my thoughts and soul; His eyes fasten on me and I stare deep into infant eyes of wisdom and compassion. Like the blinding snow in this night, joy drives through me and in the soulful silence my heart cries in awe. Far above in the rafters there is a creaking sound as a rogue wind disturbs my thoughts and stirs the drama below. I reach out to him in the dimness of the midnight; then suddenly all the shadows are consumed, by the glowing light of a full-blown moon. My weeping eyes turn icy as I find my way back to the house. The winter storm has passed, and the ground is encrusted with diamonds that crunched beneath my feet. Once inside I kneel near a tall fireplace as I begin to thaw in my body my heart and my soul. The old mantel clock tolls mid night; it is Christmas, and a Christmas like no other I have ever experienced. Out of the scripture, out of the past came shadows of celebration and the birth of love that is eternal. Warmed completely, I now finally feel the need of peaceful sleep. My senses awaken to the pungent air of ashes stirred, and flames renewed as gentle heat begins to fill my room. I must slip into my shoes and begin this busy Christmas day. Still in awe of the holy adventure of the night, I turn to the window and see everything covered in crystal-sealed snow. I made no paths in the frozen night, no shallow footprints, nothing at all. I am drawn into the gathering room by the scent of warmed cedar filling the air, where the source of the aroma stands tall and stately. A hundred glass balls found stored in a tattered trunk in the high-pitched attic decorate the tree. My husband is busy in the kitchen making his part of the dinner feast; Christmas echoes from generations past are hanging in the air and are doing battle with the aroma of the turkey baking in “real time”. In the air is the fever of anticipation for my family will arrive soon. On the radio merry carols are playing, cinnamon scented candles are flickering in the windows, and all of the stockings are carefully hung by the chimney. The shadows, were they a vision, a revelation or perhaps a special Christmas blessing I experienced on the eve of this holy day; it matters not for they touched me and I worshiped. I experienced a “God thing”, personalized and gifted for me, through dreams, remembrances, bible verses and music. A special night of re-telling when “Joy” came to my world as I went wandering right into the midst of the love of God revealed. My family is here, so my husband rings the old dinner bell that has hung in the yard for over a hundred years, in another announcement to the world. It is Christmas day, and my heart is bursting for love on so many levels. What a beautiful story. I live in Kentucky and I Love The Lord Jesus Christ with my whole heart. By her writing Rhea B. Riddle was able to take me along on her wonderous midnight experience. I thank God for that and for His Son Jesus born those many years ago.